Tervetuloa meidän kotiin kauniissa Dalyan. Kaupungissa Gulpinar, vuonna perustettu, rauhallinen ja suosittu alueella, taustalaulu päälle vuoristomaisemat, mutta vain 15 minuutin kävelymatkan päässä keskusaukiolle. Paikallisesti on lukuisia baareja, ravintoloita ja kauppoja pitkin Gulpinar kohti keskustaa. Huvilassa on kolme makuuhuonetta, kolme kylpyhuonetta ja oma uima-allas asetettu ympäröivään puutarhaan. Wi-Fi. This is a great villa in a quiet area of Dalyan and good value for the money.The garden and pool are well looked after and not overlooked.The villa was spotlessly clean throughout.Center of town is a 15 minuets walk away and a taxi back costs around £1.80 a special thanks to King rentals who provided the transfers stocked the bar and provided lunch on arrival,great start.Would highly recommend. Thanks, most kind. Glad you had a good time. Sehr Netter Kontakt und eine super Unterkunft. Die Buchung sowie die Bezahlung waren sehr unkompliziert. Den Kontakt vor Ort und die Informationen über die Anreise wurde von einer Firma namens King Rentals übernommen. Die Mitarbeiter waren sehr zuvorkommend und hilfsbereit. Die Villa war in einer Ruhigen lage aber die Stadt war trotzdem zu Fuß in wenigen Minuten erreichbar. Die Lage würde ich als optimal bezeichnen. Ebenso war auch die Ausstattung der Villa super. Die Sauberkeit war für landestypische Verhältnisse sehr gut. Jeden Tag in der Früh kam ein Poolboy der ein Teilwasserwechsel durchführte und die Anlage reinigte. Auch der Garten war sehr gepflegt mit Palmen als Schattenspender. Das WLAN war trotz unserer intensiven Datennutzung sehr stabil und schnell. Lediglich der Fernseher war nur zur DVD Nutzung ausgelegt. Ist eher aber unwichtig. Alle Räume waren mit Klimaanlagen ausgerüstet. Die Villa ist echt top und nur zu empfehlen. The Villa exceeded all our expectations and provided a home from home during our stay in Dalyan. On arrival the villa was spotlessly clean and ready at the arranged time. The pool was lovely and offered plenty of room for a decent swim. A wi-fi connection was well received from the children who unfortunately cannot seem to go a day without their facebook fix! Thanks for those kind words, look forward to accommodating you next year. A lovely villa on quiet road, no through traffic, peaceful and relaxing. Spacious, clean, modern, nice furniture, plenty of storage. Well equipped kitchen looks like it was fitted yesterday. Air-con in bedrooms, three balconies, the best overlooks the pool with mountain views. Two upstairs spotless bathrooms and a huge one downstairs. Large veranda wraps around two sides, pool area and garden are kept spotless. Villa facilities are wonderful. Small supermarket is five minutes away on foot. Bars and restaurants in town are first class and inexpensive. Key pick up and transfers couldn't have been smoother. Have stayed in Dalyan many times, this is the best, and the owner is a pleasure to do business with. What a fabulous place, great location, beautiful villa. A small peace of heaven. Das Haus liegt sehr ruhig und es gibt einen gepflegten Pool. Ich fand es prima, dass die Küche so gut ausgestattet war, so dass wir auch mit Freunden kochen und essen konnten. Die Betten waren bequem und gemütlich. Ich würde gerne wieder einmal kommen. 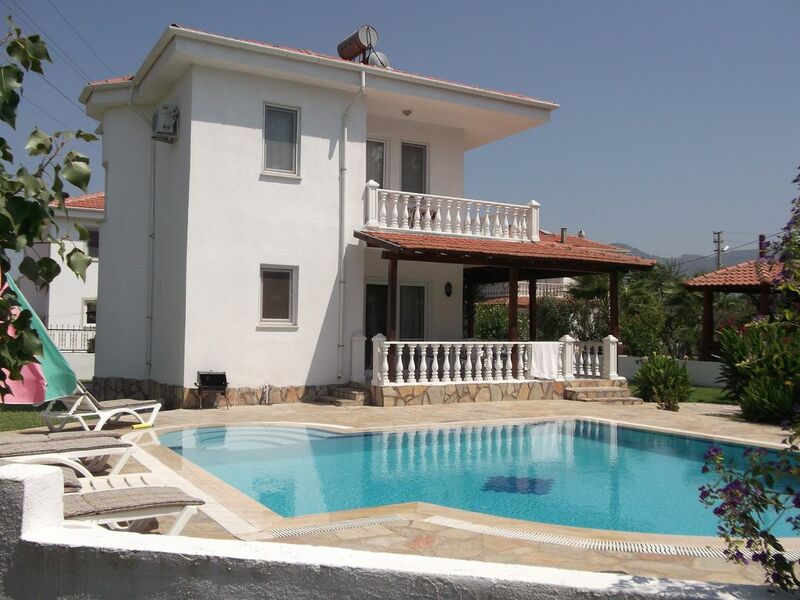 Wonderful Villa , great location ,beautiful pool . we have stayed in many villa in Daylan over the years ,and I can say this is the best I have stayed in and will be only using this one from now on . Asiakkaat voivat joko ajaa rannalle (Itzuzu, tai Turtle Beach), joka on 15 minuutin ajomatkan parkkipaikka eteläpäässä, tai vaihtoehtoisesti ottaa yksi joen veneitä ihana käämitys matka rantaan laituri pohjoispäässä . Dalaman on lähin lentokenttä, joka on lyhyen ajomatkan (25 min tai niin) ja on virkistävän helppokäyttöinen verrattuna Britanniassa! On olemassa lukuisia hyvä hinta autonvuokraus ihmisiä paikallisesti ja 4 oven perus sedan voi vuokrata noin £ 100 viikossa. Niille jotka eivät halua vuokrata auton, se ei ole välttämätöntä ja siirroista voidaan järjestää kautta agentti.